Layang-layang is an ancient tradition of kite flying in Bali, Indonesia that inspires young and old to build kites that glide with purity in celebration of their Hindu god, Rare Angon. Kites are found across south east Asia, where they have held great meaning for cultures as far afield as the Polynesian islands, such as the Maori of Aotearoa, who used them for practical purposes, but also associated several of their gods and legends with kites. The practice of kite flying in Bali is an activity that most likely pre-dates the Hindu religion that is predominant there. Many Balinese traditions are from hundreds if not thousands of years before Hinduism arrived, when animist and other forms of religion existed. Even today many of these ancient Balinese traditions are incorporated into their unique Hindu culture. One such tradition is, layang-layang, meaning many kites, is a form of praise and celebration to the god Sang Hyang Rare Angon, or simply Rare Angon. The ritual is intended to gain favour from Rare Angon to bring forth rain for recently sewn rice seed and as such was traditionally carried out just after planting season. Rare Angon is not a known Hindu god from India, but a god from Bali’s older belief systems incorporated into Balinese Hinduism and is embodied in the form of a young shepherd boy, who is responsible for the safeguarding of domesticable animals, but also associated with wind and music. Dates are very important to the Hindu Balinese, because they follow the Balinese saka calendar which is based on the phases of the moon. The calendar is very detailed, dense with information that has been through countless divinings by priests to determine their accuracy. There are definitive days in the calendar that are believed to be best for performing all manner of activities, with kite activities being of no exception. Layang-layang construction and flying must adhere to these special days for best results too. On several occasions I witnessed teams discussing the finer points of which days would suit their intentions, helping organise their harvesting of kite materials, construction days, when to have priests give their blessings to the kites and when kite festivals would most likely occur. 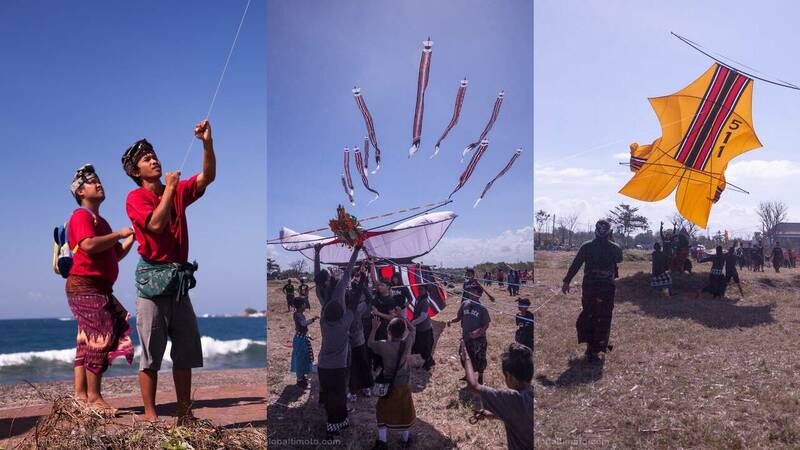 Kite teams are tightly linked to the banjars of Bali, the community centres that provide training in traditional gamelan music, dance and many other activities that enrich the lives of the young. These banjars are strongly linked to their neighbourhood pura Hindu temples and all their activities are steeped in the Balinese traditions of their religion. The banjars are lively hives of activity, full of youths and their energy, blessed by their priests in all their endeavours. Each banjar’s kite team, will build and fly kites during the laying-layang festivals. Most often the young men and boys are seen taking part, but women are also taking an interest in the flying as well as the fabrication of the kites. Balinese kites today are made from bamboo struts, cotton or synthetic cloth for the sail material, plastic fishing line for bindings, aluminium for strut slots, and some form of synthetic string or rope for the lines. In the past however, the kites were made from purely natural local resources, which also included bamboo, but were accompanied by handmade coconut string, banana leaves and other such materials. Using modern materials has changed several aspects of kite activity. Now that the kites can be built stronger and lighter, their size has increased and has brought with it a new set of challenges. With kites having wing lengths of up to 10 metres or more, the task of transporting them is quite some undertaking. Whilst many of the kites have a collapsible design, the resulting parts are still cumbersome and heavy to transport. Whilst many can get by carrying a kite’s parts around 2up on a motorcycle, the larger kites and teams which typically have more than one kite, will need to employ a large pickup truck. Now that there are so many teams involved in these festivals, the traffic and negotiation of narrow residential roads, that were never designed for the purpose, are filled with scooters, trucks, food sellers and local cattle, all whilst the event and its participants are crisscrossing frantically this way and that, as they are setting up, flying or packing up. The festivals themselves have become hugely popular, where at one time they were performed over just a few days, are now expected almost every weekend between the months of July and October every year. Whilst the ceremonial tradition is being upheld, some new components have entered the activity, most notably competition. There are 4 main types of traditional Balinese kite that are seen at the festivals. The leaf (Pecukan), fish (Bebean), bird (Janggan) and dragon (Naga), the last of which appear to be the Janggan structure with a dragon head instead of bird head. Janggan also have two different appearances, with or without very long tails. Each kite type is very distinctive and requires a particular skill in fabrication, launching, flying and landing. With each type of kite there are also different sizes, some of which are enormous. During the weekend-long festivals, the different sized kites are split into classes so that their display and competition is more evenly matched. During competitions kites and their flyers are judged and given points for; construction, launch, flying, and landing. With hundreds of participants attending the festivals, there are a necassary hoard of staff scattered around the fields, marking each kite and its team’s respective performance. Each Balinese kite has two sound generating guwungan, which are bands or ribbon stretched and held tightly across a bamboo bow, one at the top and one at the bottom of the kite’s construction. The top guwungan represents man and the bottom woman. Sound is an important part of the tradition where Rare Angon requires that both the guwungan, man and woman, strike a harmony through the sound they make. When listening to the sounds of the two guwungan humming away together, there is certainly a sense of a musical conversation taking place, as the kite glides elegantly this way and that. The sound is gentle and calming, so mesmerising that it may induce you to sleep. Whilst this scintillating sound honours the god Rare Angon, it is also a requirement for completing any flight during a competition. The requisite of this sound is deemed so important, for religious reasons, that the layang-layang competitions will disqualify a kite that has a broken guwungan band. Tim is a computer games developer turned games explorer, documenting indigenous games and sports as he travels around the world via motorcycle.